Tracing the intervals of wasp wing movement, from Marey's studies of insects. What at first might seem like an odd gesture develops into a rich historical lineage. From early attempts by Étienne-Jules Marey to capture the imperceptible motion of insect flight in La machine animale, to a fascination throughout the 19th and early 20th centuries with insects as builders, architects, and geometricians, and early research on the role of emergence in swarms and other "superorganisms," the figure of the insect haunts the history of modern technology. Indeed, the first half of Insect Media is devoted to uncovering this long history of a fascination with insects as technological animals in a pre-cybernetic moment. Part 9 of the Marey film series, dedicated to the study of the insect movements. The second half of the book examines the post-war period in which the development of cybernetics becomes the crucial mode of interfacing animal affects with technological systems, or to use the subtitle of Norbert Weiner's famous work, "Control and Communication in the Animal and Machine." However it is not to Weiner that Parikka turns, but instead to the often overlooked cybernetics of Gilbert Simondon and his theory of "individuation." For Simondon, an entity or individual is never given in advance, but is produced through an ongoing process of coming into being, a temporal becoming that works by creating embodied solutions to problems encountered within a given topology. As such, he is interested in modes of animal being that engage with and are produced by an affective relationship with a given environment. A particularly fascinating example of the ontology that Parikka is seeking to trace comes in Karl von Frisch's work on communication among bees, published in 1953 as Aus dem Leben der Bienen, or The Dancing Bees. Von Frisch's work is an attempt to describe the means through which honey bees communicate vital information to one another, such as the location of food sources. Through elaborate, almost ethnographic work, von Frisch was able to track individual members of a bee hive and observe what he described as the physical language of bees, whereby crucial information was relayed through calculated "waggling" or dancing. The bees would spin in circles, alternating directions, while vigorously waggling their bodies to indicate the direction of a new food source along with other crucial information such as distance from the hive. This dance "infects" other members of the hive, who begin the dance as well, spreading the message throughout the colony. For von Frisch, this process is akin to language, as it was a means of communicating knowledge among members of a group or society, but Parikka notes the highly affective form of this communication, and the means in which it is produced by and engages with the environment of the honey bee. Thus for Parikka, following Simondon, the bees von Frisch is referring to are not representational entities articulating signs or language, but machinological becomings. This notion of the hive as a kind of headless milieu that moves, acts, and engages with its environment or umvelt relates closely to contemporary theories of swarms and the swarm-logic of networked communication. An emergent structure of multiple bodies or objects functioning in unison, swarm intelligence characterizes computer science algorithms, multi-agent systems, and insects. In 1986, Craig Reynolds developed a model for coordinated, swarm-like animal motion, calling the flocking creatures "boids." If this language of becoming is familiar, it may be that it is pulled, in part, from the work of Gilles Deleuze and Félix Guattari, who were themselves influenced by figures such as Gilbert Simondon and the pioneering work of the biologist Jakob von Uexküll.6 If instead this all seems somewhat alien, then it should be. It is the goal of Parikka's work to dehumanize media technologies, showing the ways in which they are produced within and often adapted from a long history of animal affects, and might themselves be seen as engaging with the world in a form of non-human affect. Through Insect Media, Parikka describes what he identifies as a "technics of nature," which describes the way in which it is not only humans who fabricate things and create artifacts to establish relations with the world, but in fact the whole of nature that can be seen as a dynamic process of relations, perceptions, durations, and cohabitation that is active and creative.7 Thus, if Parikka is advancing a critique of earlier new media projects, it is a critique of the emphasis on the human body and its senses, and the deeply humanist phenomenology in which the individual perceives, but remains abstracted from the world. Parikka suggests alternate and additional modes of engagement, suggesting that media art also works through "embodied technics" in which the bodies involved become experiments and probings in nonhuman technics in themselves. For Parikka, "what needs more emphasis is the primacy of animality as a regime of the pre-individual […] to the various potentials of becoming outside our established bodily coordinates and the differing potentials of sensation of which animals have been good reminders. "8 What technical media and insects share is a non-human perspective, and Parikka wants to use insects as a figure of thinking to illuminate those sides of our experience that are non-conscious: affect, instinct, embodiment and knowledge that stems from an unfolding, intensive embodiment in milieu relations.9 In short, "digital technologies and art expose the animal in the human being. "10 That is, those bodies and systems that are radically nonhuman. (1) Parikka, Jussi. 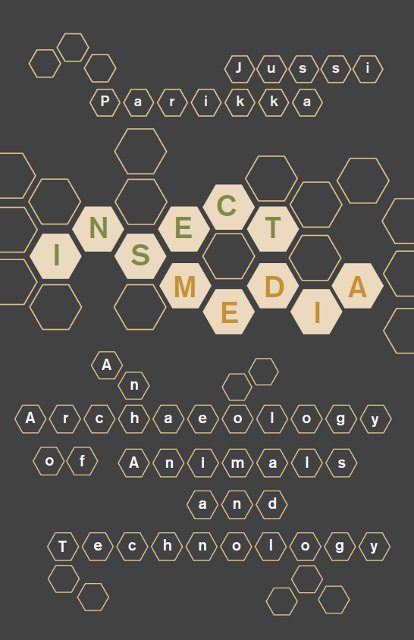 Insect Media: An Archaeology of Animals and Technology. Minneapolis: University of Minnesota Press, 2010. (6) Another important figure in Parikka's archaeology of animals and technology, Uexküll's theory of umwelt or "self-centered worlds" and the particularly famous case of the umwelt of the tick is taken up in the work of theorists as diverse as Martin Heidegger, Gilles Deleuze, and Giorgio Agamben. (7) Parikka, Jussi. Interview by John Protevi. "New APPS Interview: Jussi Parikka on his new book 'Insect Media'". New APPS: Art, Politics, Philosophy, Science, 2011. Web. April 19, 2011.